As You Are: Newcomer Miles Joris-Peyrafitte’s film wants to be many things at once: It’s a lo-fi grunge-era teen stomper with a wailing reverb soundtrack, a confused sexual identity drama, a burgeoning young romance, and a showcase for the fine cinematography of Caleb Heymann, but with all of its competing agendas, it feels severely overlong, and unnecessarily cluttered with plot points and scenes that don’t add up. Two boys, shy, artistic skater Jack (Owen Campbell), and the more aggro Mark (Charlie Heaton), are thrown together when their respective single parents (Mary Stuart Masterson and Scott Cohen) hook up and move in together. The boys are fast friends, and before long Mark has Jack and mutual friend Sarah (Amandla Stenberg) sneaking out of class and smoking dope with him in rock quarries and such. After about a year, their parents break up and Mark is forced to go back to living with his abusive father on his own, but not before certain longings develop between he and Jack. The film is shot mostly in flashbacks, with occasional scenes of various characters being interrogated by a police detective in the wake of what appears to be something pretty serious. It’s an industrious conceit, one that keeps chopping things up into smaller and smaller pieces and laying them over each other, but the story never quite hangs together (the boys lived together in the same bedroom for more than a year, and yet their romance doesn’t take off until they are apart), and its intentionally inconclusive ending can’t quite hide its shortcomings. 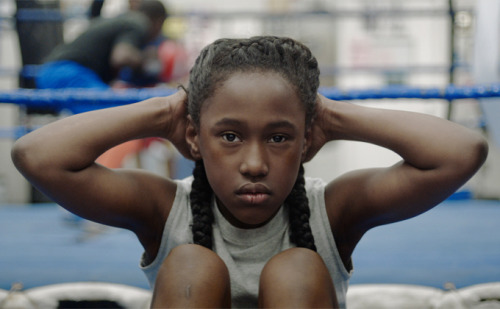 The Fits: A captivatingly nebulous film from narrative newcomer Anna Rose Holmer that evokes the great Picnic at Hanging Rock in its willfully ambiguous use of a female adolescence metaphor. Toni (Royalty Hightower) is something of a tomboy, hanging around her older brother (Da’Sean Minor) at his boxing gym. When she spots a group of girls working out diligently for their school dance squad she eventually becomes interested enough to join the team, but shortly after she does a mysterious outbreak of epileptic-type seizures begins to affect some of her teammates. It starts with a couple of older girls before trickling down to the younger ones. At first, Toni, like the others, is terrified of them, but eventually, they come to see them as a rite of passage, and therefore something for which to yearn. Aiding Holmer’s appropriately minimalist script is the fine camera work of DP Paul Yee, who infuses the film with just the right amount of dream-like abstruseness to make the project truly come together. It’s the kind of film that has no intention of providing you with concrete answers, which makes it all the better suited towards its material. Goat: Young man (Ben Schnetzer) gets beaten up badly. Young man is traumatized from this event and decides the best way to purge the creeping sense of his emasculation is to start college and pledge the rowdy frat of his older brother (Nick Jonas). Frat makes boy do terrible, super-gross things, threatens him and others with actual goat. One pledge (Danny Flaherty) doesn’t make it – literally. Frat is investigated for wrong-doing, is found lacking and is shut down. Previously traumatized young man has it out with frat, and brother, and possibly one of the men who beat him up. Nothing is quite resolved, but the film ends. The goat remains distressingly unaccounted for. Oh, and the film has a cameo from James Franco for some reason. Morris From America: Morris (Markees Christmas), a sweet-faced, 13-year-old kid obsessed with hip-hop, lives in Heidelberg with his dad, Curtis (Craig Robinson). They’re from the U.S., there so Curtis can help coach the local soccer team. Displaced, and recently having lost his mother, Morris tries to keep a low-profile in his new adopted country, but the novelty of a black kid in this lily-white German enclave keeps bringing him unwanted attention. At various times, he’s accused of selling drugs, assumed to be a basketball player, and asked to dance in clubs, none of which is what he’s about. Instead, the girl he does want attention from, Katrin (Lina Keller), a stunning blonde 15-year-old, keeps toying with his affections, bringing him along on her wild nights with her DJ boyfriend, all of which brings him further and further away from his still-mourning father. Chad Hartigan’s film is clever enough, and has an amiable soul, but it suffers from easy plot devices (Katrin’s interest in Morris, a boy two years younger than she, is very suspect, and largely unexplained, other than the way it propels the plot forward), and a sort of meandering tone. Still, fine performances from Christmas and, especially, Robinson, who delivers a third-act monologue that is nothing short of masterful, help keep the film afloat, and it’s dexterity keeps it relatively fresh. Tomorrow: I sail home, on gossamer wings, and sleep like an angel tucked into a field of cumulonimbus. Photo: From The Fits, courtesy Yes, Ma’am! Into the frigid climes and rarefied thin air of the spectacular Utah Mountains, I’ve arrived in order to document some of the sense and senselessness of the 2016 Sundance Film Festival. Over the next week, armed with little more than a heavy parka and a bevy of blank reporter’s notebooks, I’ll endeavor to watch as many movies as I can and report my findings.